Personalized Printing now offers digital printing services on our new Tobisha 8130 copy machine. 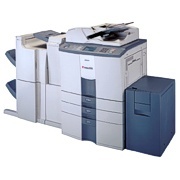 The Toshiba 8130 is a high volume printer/copier with many capabilities. Several functions of this machine includes collating, three hole punching, stapling, and booklet saddle stitching. It will also reduce a document down to 25% or enlarge it up to 400%. It can handle any type of paper from 20# copy paper to 80# cover stock and up to 12 x 18. We can handle anything from the smallest copy job to the largest digital printing job. Bring in your originals or your digital files (floppy, zip, or CD) and let Personalized Printing take care of the rest. A unique blend of skills allows Personalized Printing to produce any of your printing needs. From simple forms, to 1, 2 and 3 spot colors, to 4-color process. We are efficient in quantities from 1,000 to 100,000. Our goal is to serve you - our client - with the best possible quality and service.